If fruit is good for me, why can’t I eat as much as I want? I get asked this question at least twice a week. The answer I often give people is that it depends on their individual goals and what role they wanted fruits to play in their overall diet. Fruit is a good source of complex carbohydrates and they contain naturally occurring sugars that convert to glycogen. Fruits are the body’s first choice of fuel, so the body burns them during exercise or physical activity. For example, if you are a long-distance runner, fruit can be a good source of fuel to help you go the distance. But if you are trying to lose weight, and you eat a piece of fruit like a banana before your workout, that will be the first thing the body burns and you won’t burn fat. If your body has no quick source of fuel, it will tap into your fat stores and promote weight loss. (A) Sugar in fruits, in the form of fructose, can cause weight gain or other health issues, particularly in the liver. Fructose increases insulin resistance, blood cholesterol, abdominal fat and raises ghrelin levels, the hormone that controls hunger. (B) Fructose is only harmful in large amounts. You would have to eat a lot of fruits to ingest too much fructose. The amount of sugar in fruits (12 grams for an orange or banana) is lower than what we get in soda pop (39 grams for a can of Coke) or a chocolate bar (35 grams in a Mars bar). (C) Fruits are good sources of fibre, water, amino acids and many nutrients, including potassium, dietary fibre, vitamin C and folate (folic acid). That fibre and water will make us feel more full and slow the sugar absorption in our systems. Diets rich in potassium may help to maintain healthy blood pressure. 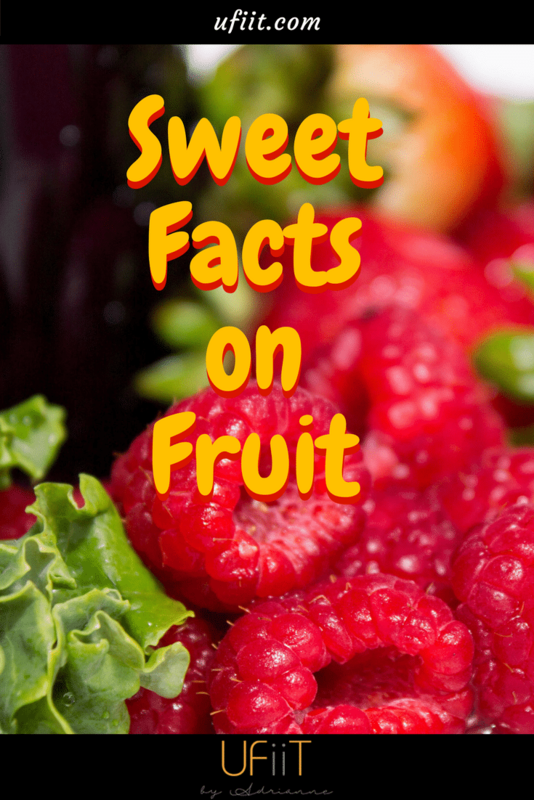 (D) Most fruits are low in fat, sodium and calories. Because of the sugar content, eating too much fruit can hurt your weight-loss goals. Eating too much fruit can also lead to unpleasant stomach issues. Eating large quantities of high-acidic fruits like oranges and pineapples are often problematic for people who have acid reflux and should be limited or removed from a diet, especially at night. Remember that day you went to the berry farm and ate most of what you picked before you got home? I’m sure your stomach didn’t like you after that. Our Ufiit rule is never eat fruit past 2 p.m. (unless you are a shift worker, then adjust your time based on when you sleep and wake-up.) The reason comes back to excess sugar intake that can spike blood sugar levels. Fruits are delicious and beneficial, but sometimes we can rely too much on fruit as a part of our diet. Fruits are convenient easy to grab and a great go to. They can also sometimes help for filling you up, but relying on fruits as a replacement for a balanced diet rich in nutrients is the wrong strategy. Nutrition is the science of how we fuel our body. We need protein, carbohydrates and fats to keep our body running well. There are no quick and easy fixes for good nutrition — even an apple a day cannot keep the doctor away. I’m not saying, “don’t eat apples,” I’m saying, “Eat it, but be ready to earn it. Fruits are delicious and great but making them the sole source of your nutrition will not to take you to the next level. Our Ufiit clients know that overeating fruits can be problematic — like overdoing most things. But the simple notion that moderation is the answer to all nutritional questions is vague at best. Is one piece of fruit moderation, maybe it is three pieces? Track your diet and note how you respond to the food you are eating, including fruits. And you will learn what works properly for you. The Ufiit approach to nutrition is guided by education and simplicity. The method we use is based on the fact that no two of us are alike, so we cannot all follow the same path. We help client’s understand how to tailor their own individual lives to match the specific health, fitness or weight-loss goals they desire. We teach clients to ignore the noise and focus on the fact. This keeps it simple and effective because they learn the facts as it relates to their specific selves and individual goals. Here are some examples of fruits that are lower in sugars. Figs: 8 grams of sugar per medium fig. There is so much confusion or “alternative facts” in health, fitness, weight-loss and wellness. There are always so many different takes or angles promoted by different people for numerous reasons. Some takes or beliefs are legitimate and some are not, this causes a lot of confusion for people that are starving for answers. This is my suggestion when people ask questions about health, fitness, weight-loss or wellness. Approach any information with some caution and curiosity. Ask if the information applies to you as an individual. Then do some research to see how many other people had the same information and what their views are about it. Only when you have followed these steps should you can consider adopting the information or declining it. Reference the USDA fruits and fructose chart below.